Planning for an attack eastward to the Rhine to smash and clear the enemy salient south of Drusenheim began on January 26. By the time the first phase of the broad general attack jumped off, a sudden thaw, melting the foot-deep blanket of snow, had intervened, jeopardizing the fulfill. ment of a swift armor-infantry-team assault. On the night of January 31, the 2nd Battalion, 142nd Infantry, moved out across the Moder River with the mission of seizing Oberhoffen, a small town upstream from Bischwiller. Stealthily flanking the triangular-shaped village on the open ground to the east, the battalion worked into town and seized first objectives with easy success. But at dawn, before armor-carrying bridges over the Moder could be completed, German tanks and infantry lashed back in wild fury and threw out the 2nd Battalion infantry. By noon our forces had lost all objectives in Oberhoffen except a small foothold in the southern extremity. With bridges in, the fight for Oberhoffen had to begin all over again. Armor was brought across the river and thrown into the second assault but the situation changed very little. By late afternoon the 1st Battalion moved up to pass through the 2nd. While Company A attacked frontally a German strongpoint at the main road fork, Company C skirted the town from the south after dark and delivered a stunning blow to the rear. The pincers snapped the resistance before Company A, and soon both companies had consolidated a new line 300 yards above the fork. For another forty-eight hours the 1st Battalion continued a slow, methodical advance clearing Oberhoffen house by house, and driving off the enemys mammoth Royal Tiger tanks sent in to stop it. On February 3, with all the northwest corner of Oberhoffen won, the 1st Battalion turned over the sector to an armored infantry battalion for a three-day interval. 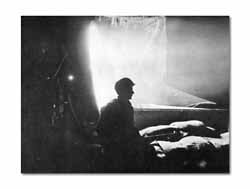 A combat innovation introduced by the 36th in the Seventh Army sector, anti-aircraft searchlights, emplaced several thousand yards to the rear, cast synthetic moonlight over the immediate front and aided doughboys on defense by showing up any moving object. The lights could be turned on or off as the situation warranted. After snows melted, scores of KO'd tanks dotted Herrlisheim battlefield. Division infantry units in reserve tested the effectiveness of camouflage capes and whitewashed tanks. Whitewashed to blend with the snow, our tanks crossed the treadway bridge over the Moder. Failure to win Oberhoffen in twenty-four hours and the appearance of strong German forces there cost a one-day delay in the Division attack for Rohrwiller and Herrlisheim. The decision to proceed after dark of February 2 on this second phase was taken as the extreme thaw entered its fourth day. By jump-off time, the flat ground, criss-crossed by numerous streams and canals, had turned to swelling pools of water. The Moder River overflowed its banks, and its icy torrents washed away all the footbridges at Bischwiller. It covered the treadway bridge where foot soldiers crossed and waded through 300 yards of flooded ground to reach nearby assembly positions. Four battalions figured in the sweeping Division attack: on the left, the 3rd Battalion, 142nd, moved out to seize the Drusenheim woods; in the center, the 1st Battalion, 143rd, had Rohrwiller as its objective; the 2nd Battalion, 143rd, on the right of the 1st after cutting the important Drusenheim-Herrlisheim road link at the junction east of Rohrwiller, would then turn south to hit Herrlisheim from the north; on the Division right the 3rd Battalion, 141st, had the difficult mission of taking Herrlisheim on a barren approach from the south. Infantrymen of the 143rd plowed through knee-deep mud and water, stumbled over many a quick-running ditch to close in on Rohrwiller. Happily a flight of friendly bombers roared overhead to drown out the noise of approaching troops. When the 1st Battalion broke into town it was evident that the enemy had been caught napping. Radios were still playing, field phones connected. In one house were freshly-dressed ducks and a newlyslaughtered pig. Before daylight 120 prisoners had been rounded up in the town. Tanks and weasel tractors, following the infantry and bringing up bridging materials, early bogged down in the mire. By hand, men dragged the heavy bridge parts crosscountry to the sites where they were to be used. Southeast of Rohrwiller two vital bridges were seized intact by the alert 2nd Battalion, which pushed on to gain its objective at the road junction by dawn, February 3. The 3rd Battalion, 142nd, walked to within 100 yards of the dark line that marked the edge of Drusenheim woods, when five enemy machine gunners broke the silence. A whooping I Company Indian-style assault chased the enemy gunners. But the Germans, after being aroused, concentrated five tanks for an attack that sent K Company streaming back across the Moder. By morning, however, elements of the 3rd Battalion were holding water-filled foxholes on their objective, the south portion of the woods. 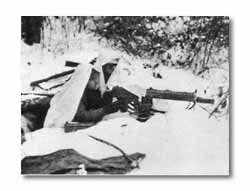 In a combat position near Weyersheim the bed sheet blended well with the snow. In one week while on defense snow piled to one-foot depth. 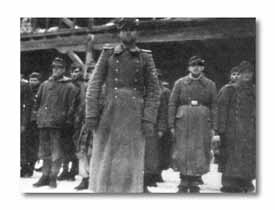 Lanky, SS Lieutenant Helmut Kunte, was the 20,000th prisoner taken by the Division after the Southern France landings. He was captured by the 143rd. 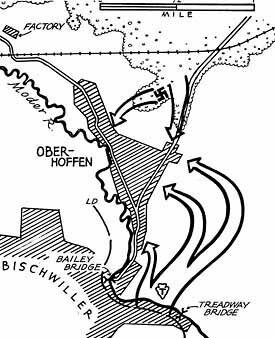 Failure to get supporting armor over river obstacles early, thwarted opening attacks on Oberhoffen (above) and Herrlisheim (below). Both towns were eventually taken. Companies I and K led the attack of the 141st for Herrlisheim. Both had to cross a canal by footbridge, then make a two-kilometer approach on open terrain to the objective. Enemy-held Offendorf closely flanked the attacking parties on the east. The troops, crossing the line of departure at 0300, were beset by similar mud-and-water lagoons sorely affecting the advance. When within 400 yards of Herrlisheim, German weapons sounded the alarm. Soon a heavy fire fight flared up until, at daylight, some 175 of the Battalion broke for the shelter of the town buildings. A great deal of confusion occurred after reaching the buildings when regular fighting teams were split and reorganization could not be effected. The Germans had strong points in eight houses on the edge of town. Though attacking troops took up firing positions within buildings and in foxholes around eight other houses, many of the men woefully learned that their mud-caked weapons were of little use, hopefully waited for reinforcement and for tanks which could blast the enemy opposition. The tanks never appeared, as flood conditions which caused the canal to rise four and one-half feet in six hours delayed completion of a necessary bridge. 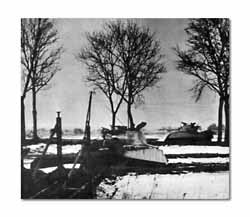 Two German tanks came up the road from Offendorf and were able to drive out a platoon of Company I after 45 minutes exchange of fire. Finally Company I and K commanders ordered withdrawal from Herrlisheim. 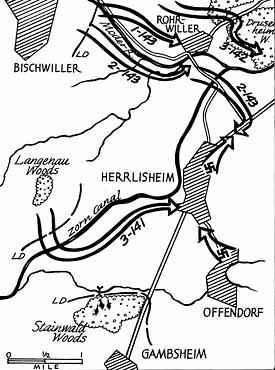 Spurred on by this result, the Germans rallied north of Herrlisheim and drove the 2nd Battalion, 143rd off its objective, the road junction. Rohrwiller came under shellfire but was firmly held. Further Division attacks during the day cleared the Drusenheim woods. Two days later the result of this difficult four-battalion attack was more fully realized when the Germans, faced with encirclement on the north, abandoned Herrlisheim and Offendorf. On February 6, after these towns were occupied, patrols of the 141st were posted along the Rhine. On January 10 the 2nd and 3rd Battalions, 143rd, from the new line at the forward edge of the Drusenheim woods, attacked to seize Drusenheim. Elements of Company E and Company K got into town past anti-personnel mines, machine-guns and barbed wire entanglements. A strong road block south of town on the right held up Company G. By late afternoon, however, when the cost of the effort became bitterly high, troops were ordered to return to their former positions. 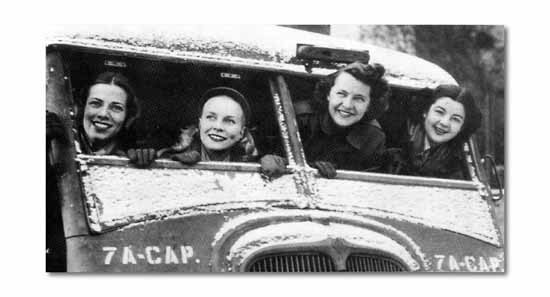 HOLDING THE LINE, TOO, were the 36th's smiling, doughnut serving Red Cross girls. Left to right: Dorothy Boschen, Virginia Spetz, Jane Cook, Meredyth Gardiner. 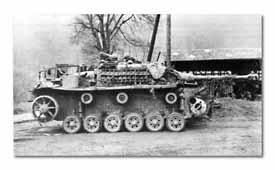 A captured German vehicle became their supply truck.